Moldavite is a unique green tectite found in South Bohemia, Bohemia, Czech Republic. 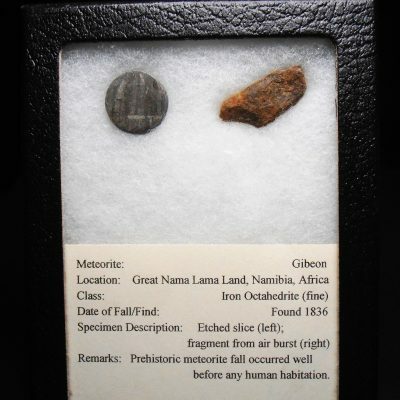 They were created approximately 14.7 million years ago when a giant meteorite impacted the earth near modern day Nordinger Res. The liquified crust, caused by the impact, was ejected into the atmosphere and then fell back to earth in a scattered pattern extending hundreds of square miles. As the molten material fell splatter and aerodynamic surfaces were created on the pieces as they cooled. It is a unique green tektite that is similar to obsidian or volcanic glass and contains the elements Si and O.This tektite measures 19 x 16 x 8 mm and weighs 2 grams.